Inspired by an old post of Mike’s (Sweet Tea and Bourbon) on Italian subs…I thought I would share a photo of the best Italian sandwich I have EVER had. It’s called The Gambino and it is made by Cochon Butcher. The description says it is made with “house meats and herb viniagrette.” Those words do not do justice to their house made sopresatta, coppa and other cured meats that are beyond delectable. The bread is perfect and the viniagrette is fresh and tart. They also provide homemade potato chips. A cute bar is included in this small storefront, with an amazing (from scratch!) Bloody Mary – always good to have in N.O. I generally take a cooler and do a little shopping there as well. Last time I came home with a jambalaya-stuffed chicken, boudin, tasso and andouille, as well as bread & butter pickles and Sweet Potato Hot Sauce. 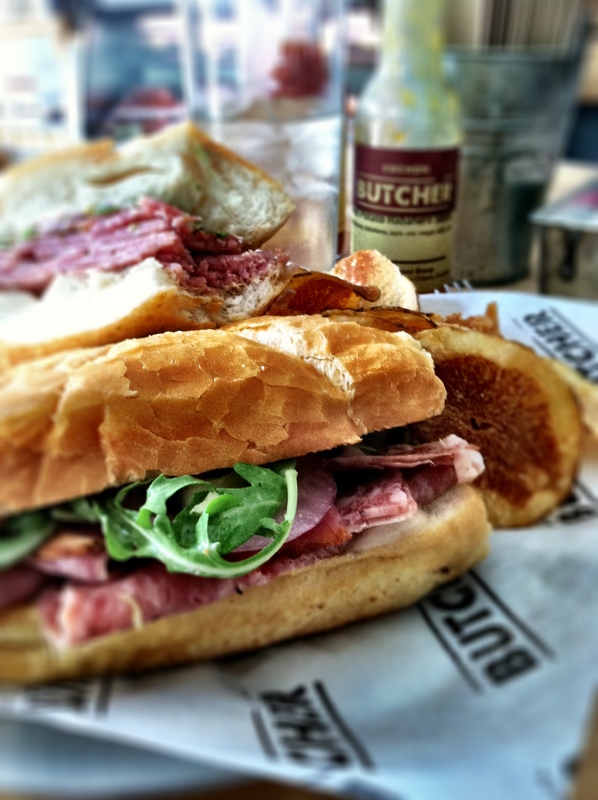 I would live within walking distance of Cochon Butcher if I lived in New Orleans. Amazing. LOVE Cochon and love this pic! Aw! Much love to you A-Flizzle, my Nizzle!